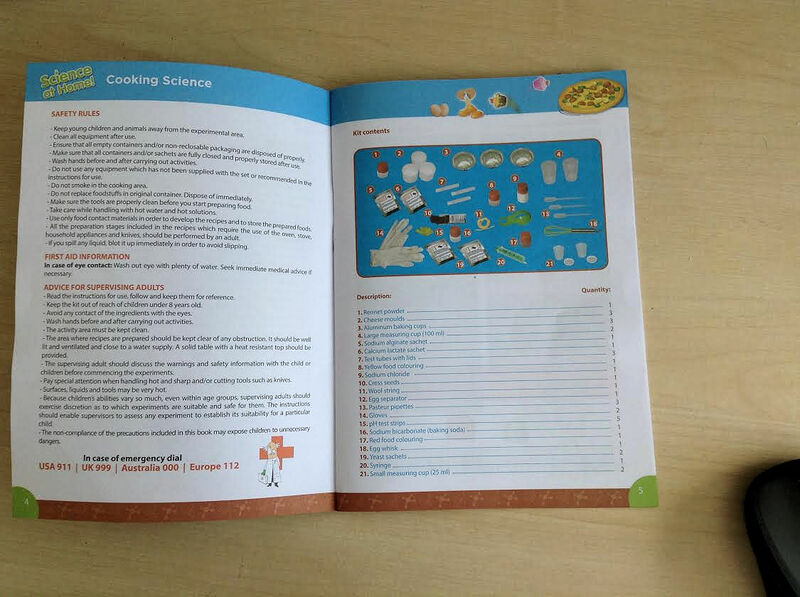 Educational booklet, Rennet powder, Yeast sachets, Baking soda, Sodium chloride, Calcium lactate sachet, Sodium alginate sachet, Red food colouring, Yellow food colouring, Cress seeds, Cottage cheese moulds (3), Egg whisk, Aluminum baking cups (3) ,Egg separator, Small plastic cups with lids (2), pH test strips, Wool string, Pasteur pipettes (3), Test tubes with lids (3), Large plastic cups, (2) Syringe, Gloves. It costs £7.99 and gives me some things to play with that I’m really pleased about – sodium alginate powder, rennet powder, and calcium lactate – all useful ingredients to show how food is made. And there’s some useful pH test strips, and plastic test tubes, with plastic pipettes – so worth the money for that. 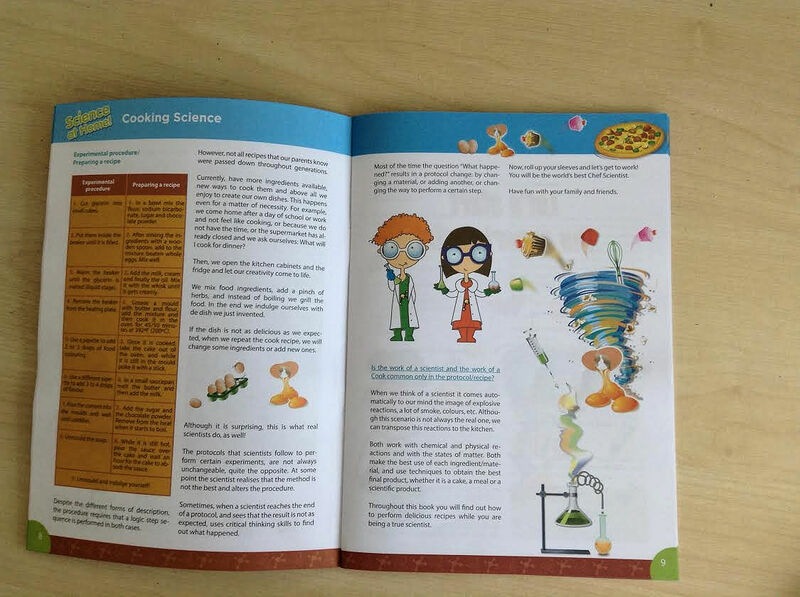 The book has been written for American children as measurements are in cups, and there are plenty of warnings that adults must do most of the cooking and experiments. There are some typos – ‘de’, ‘desert’ , but I’ve made typo mistakes in my time! Big words like protocols and protocol change, catabolism Experiments are to be observed and analysed but ‘do not eat food you used for the experiments’. If good hygiene is observed when making yogurt surely it can be eaten? Some of the scientific explanations don’t make sense to me – what is lactate calcium, ‘yeast feeds on starch which is the sugar naturally present in flour’ – I think needs clarification. Here are experiments listed – Yogurt making, Instant icecream made by mixing the salt into ice which lowered the temperature, Making spheres from fruit juice, Watching yeast ferment in test tubes – for Food Science You Can Eat I used plastic water bottles, Homemade bread and buns – these are really just recipes but I like the use of the egg separator! Experiment 12 uses the calcium lactate and sodium alginate to create a gel from fruit juice – used by chefs to show off posh dishes. Interesting result – but I’d like to know more of its uses in food production. Experiment 13 makes fruit gums but assumes we have some agar-agar. 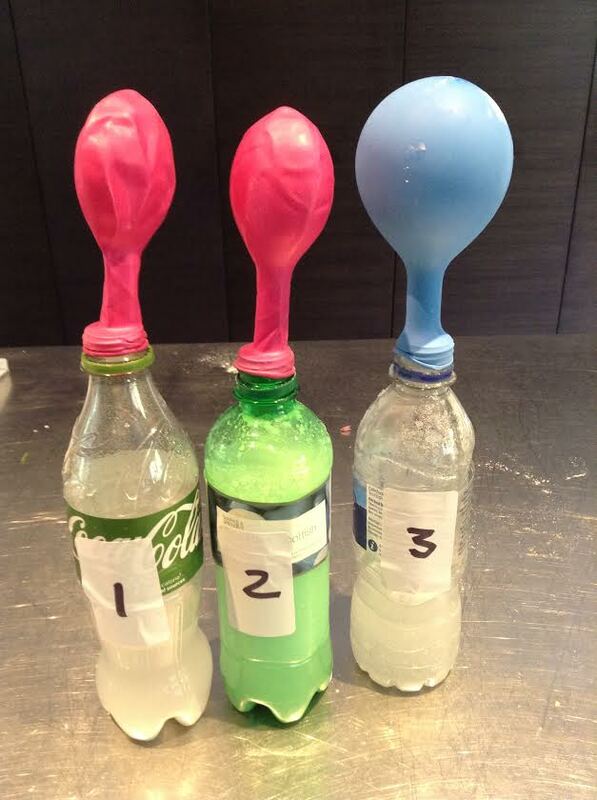 I used to use it in science lessons to make a solution for petri dishes, but it’s not in my store cupboard.
. Experiment 18 Flour glue – ‘make a smooth and homogenous mixture’ – Expt 19 make Pasty figures. 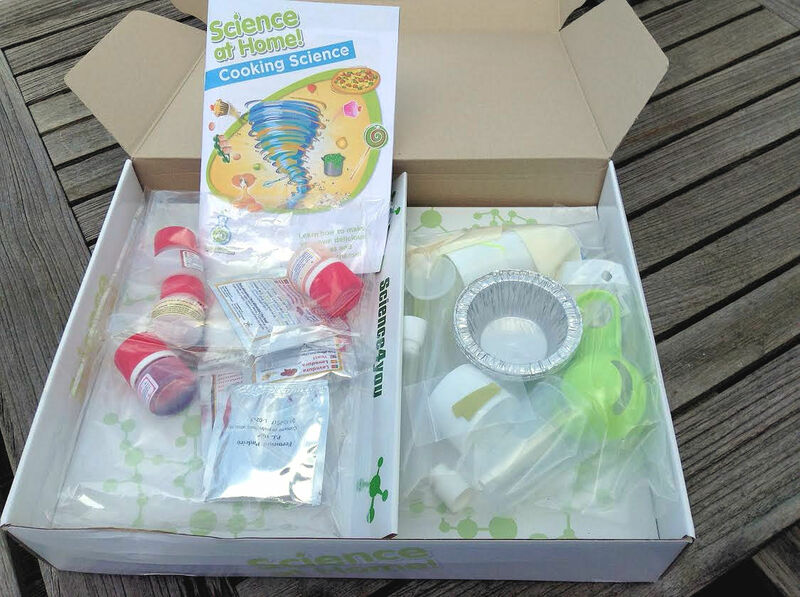 So in summary – have fun opening the packets but beware of some explanations! And wonder why some of the experiments are suggested. But worth £7.99 just for the packets and bits! ← Food Science You Can Eat – would you buy it?